Need Help Configuring Nagios Core? Tired of managing complex configuration files with Nagios Core? Create configurations using wizards and manage configurations in the Core Config Manager GUI. 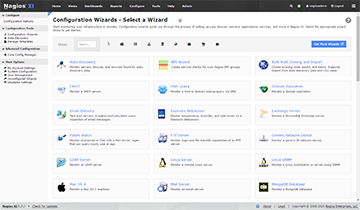 Nagios XI includes web-based wizards and GUI core configuration management that make monitoring servers, network devices, applications, and services easier. One of the features of Nagios' object configuration format is that you can create object definitions that inherit properties from other object definitions. An explanation of how object inheritance works can be found here. I strongly suggest that you familiarize yourself with object inheritance once you read over the documentation presented below, as it will make the job of creating and maintaining object definitions much easier than it otherwise would be. Also, read up on the object tricks that offer shortcuts for otherwise tedious configuration tasks. Please refer to the Object Inheritance With Templates page for detailed information on how they work. Note: Sample object configuration files are installed in the /usr/local/nagios/etc/ directory when you follow the quickstart installation guide. An object definition file can include other object definition files with the use of the include_file=<file_name> and include_dir=<directory_name> directives. The former includes the single file specified, the latter will process all files ending in the .cfg extension in the directory specified. These directives may be repeated to include multiple files/directories. The directives are not allowed within the actual definition of an object, and should appear before, after, or in between any object definitions. They are closely related to the cfg_file= and cfg_dir= directives in the main configuration file. These directives may be chained; e.g. an object definition file included from the main configuration file with a cfg_file= or cfg_dir= directive can use include_file= or include_dir= to include another object definition file, which in turn can also use include_file= or include_dir= to include yet another object definition file, and so on. This can be useful when certain objects are dynamic but need to pull in a number of configs or when certain configs files grow to an unmanageable size. address: This directive is used to define the address of the host. Normally, this is an IP address, although it could really be anything you want (so long as it can be used to check the status of the host). You can use a FQDN to identify the host instead of an IP address, but if DNS services are not available this could cause problems. When used properly, the $HOSTADDRESS$ macro will contain this address. Note: If you do not specify an address directive in a host definition, the name of the host will be used as its address. A word of caution about doing this, however - if DNS fails, most of your service checks will fail because the plugins will be unable to resolve the host name. importance: This directive is used to represent the importance of the host to your organization. The importance is used when determining whether to send notifications to a contact. If the host's importance value plus the importance values of all of the host's services is greater than or equal to the contact's minimum_importance, the contact will be notified. For example, you could set this value and the minimum_importance of contacts such that a system administrator would be notified when a development server goes down, but the CIO would only be notified when the company's production ecommerce database server was down. The importance could also be used as a sort criteria when generating reports or for calculating a good system administrator's bonus. The importance value defaults to zero. In Nagios Core 4.0.0 to 4.0.3 this was known as hourly_value but has been replaced with importance. obsess_over_host|obsess *: This directive determines whether or not checks for the host will be "obsessed" over using the ochp_command. Values: 0 = disabled, 1 = enabled (default). notification_interval: This directive is used to define the number of "time units" to wait before re-notifying a contact that this host is still down or unreachable. Unless you've changed the interval_length directive from the default value of 60, this number will mean minutes. If you set this value to 0, Nagios will not re-notify contacts about problems for this host - only one problem notification will be sent out. first_notification_delay: This directive is used to define the number of "time units" to wait before sending out the first problem notification when this host enters a non-UP state. Unless you've changed the interval_length directive from the default value of 60, this number will mean minutes. If this directive is used notifications will be sent out after the next check is performed following the first_notification_delay time. If you set this value to 0, Nagios will start sending out notifications immediately. stalking_options: This directive determines which host states "stalking" is enabled for. Valid options are a combination of one or more of the following: o = stalk on UP states, d = stalk on DOWN states, and u = stalk on UNREACHABLE states. As of Core 4.4.0 you can use the N option to log event states when notifications are sent out. parents: This directive is used to define a comma-delimited list of short names of the "parent" services for this particular service. Parent services are typically other services that need to be available in order for a check of this service to occur. For example, if a service checks the status of a disk using SSH, the disk check service would have the SSH service as a parent. If the service has no parent services, simply omit the "parents" directive. More complex service dependencies may be specified with service dependency objects. importance: This directive is used to represent the importance of the service to your organization. The importance is used when determining whether to send notifications to a contact. If the service's importance value is greater than or equal to the contact's minimum_importance, the contact will be notified. For example, you could set this value and the minimum_importance of contacts such that a system administrator would be notified of a disk full event on a development server, but the CIO would only be notified when the company's production ecommerce database was down. The importance could also be used as a sort criteria when generating reports or for calculating a good system administrator's bonus. The importance value defaults to zero. In Nagios Core 4.0.0 to 4.0.3 this was known as hourly_value but has been replaced with importance. This directive is used to specify the short name of the command that Nagios will run in order to check the status of the service. The maximum amount of time that the service check command can run is controlled by the service_check_timeout option. obsess_over_service|obsess *: This directive determines whether or not checks for the service will be "obsessed" over using the ocsp_command. Values: 0 = disabled, 1 = enabled (default). first_notification_delay: This directive is used to define the number of "time units" to wait before sending out the first problem notification when this service enters a non-OK state. Unless you've changed the interval_length directive from the default value of 60, this number will mean minutes. If this directive is used notifications will be sent out after the next check is performed following the first_notification_delay time. If you set this value to 0, Nagios will start sending out notifications immediately. stalking_options: This directive determines which service states "stalking" is enabled for. Valid options are a combination of one or more of the following: o = stalk on OK states, w = stalk on WARNING states, u = stalk on UNKNOWN states, and c = stalk on CRITICAL states. minimum_importance: This directive is used as the value that the host or service importance value must equal before notification is sent to this contact. The importance values are intended to represent the value of a host or service to an organization. For example, you could set this value and the importance value of a host such that a system administrator would be notified when a development server goes down, but the CIO would only be notified when the company's production ecommerce database server was down. The minimum_importance value defaults to zero. In Nagios Core 4.0.0 to 4.0.3 this was known as minimum_value but has been replaced with minimum_importance. servicegroup_name: This directive is used to specify the short name(s) of the servicegroup(s) that will inherit the dependency. Multiple servicegroups should be separated by commas. dependent_servicegroup_name: This directive is used to specify the short name(s) of the servicegroup(s) that the dependent service "runs" on or is associated with. Multiple servicegroups should be separated by commas. Note: Directives in red are required, while those in black are optional. Optional directives, if left blank, will be inherited from the service object. notification_interval: This directive is used to determine the interval at which notifications should be made while this escalation is valid. If you specify a value of 0 for the interval, Nagios will send the first notification when this escalation definition is valid, but will then prevent any more problem notifications from being sent out for the host. Notifications are only sent out when the host recovers. This is useful if you want to stop having notifications sent out after a certain amount of time. Note: If multiple escalation entries for a host overlap for one or more notification ranges, the smallest notification interval from all escalation entries is used. Tip: As of Nagios Core 3, all directives contained in extended host information definitions are also available in host definitions. As of Nagios Core 4, the hostextinfo object is deprecated and will be removed in a future version of Nagios Core. Tip: As of Nagios Core 3, all directives contained in extended service information definitions are also available in service definitions. As of Nagios Core 4, the serviceextinfo object is deprecated and will be removed in a future version of Nagios Core.